Parkour and Ninja Warrior is a great opportunity for those kids who want to be active and engaged in something different than a team sport, as well as members of team sports who would like to improve reaction time, coordination, explosiveness, and flexibility. It is a great class to encourage any child to move and bounce around while actively strengthening their agility and coordination. While engaging kids physically, it engages their mental strength and stamina. The class is taught in a safe environment by experienced athletes, and it is available for students of all experience levels. Approaching a new run, jump, or aerial maneuver can be daunting and is a terrific way to learn how fun it can be to take risks and achieve goals. It does this by using movements such as vaults, jumps, and climbs. Aviator Gymnastics recently added a modular setup with wood boxes and metal rails. 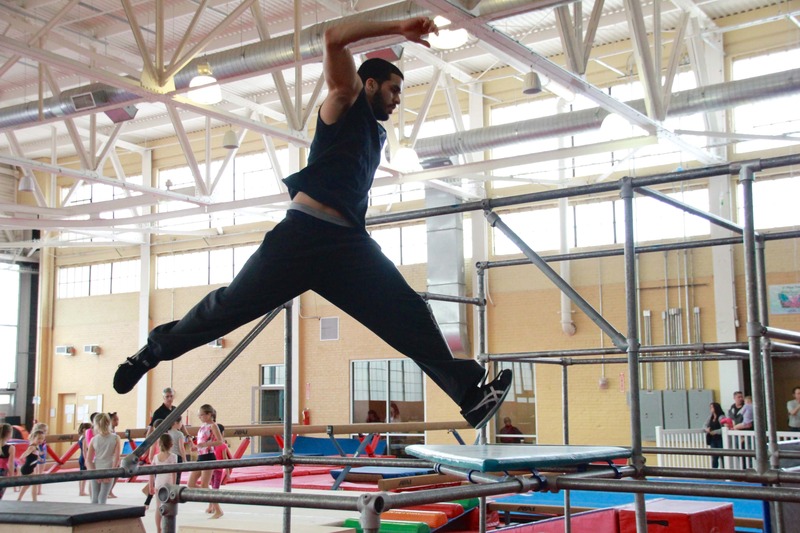 This setup is fully customizable and coaches will change the layout every week to create fun and challenging ways to test athletes parkour skills. If you haven’t heard of it already, you will soon- Ninja Warrior has been steadily growing in popularity among both children and adults over the last few years, and has now found a home in the Aviator Gymnastics center. Ninja Warrior is complex obstacle course that will challenge the strength, speed, and endurance of all participants. Students will have to make their way through the course as fast as they can, trying their best to overcome each individual obstacle. Complete with slanted steps, ringtoss, unstable bridges, cannonball alley, cargo net swing, rumbling dice, spider wall, TWO warped walls, and more. Aviator’s Ninja Warrior course will feature a variety of different challenges for students to overcome. Our Ninja Warrior program will begin as an extension of our current parkour classes. Although they are two distinctly different activities, they overlap in many areas and complement each other well. While parkour places focus on creativity, exploration, and creating individual challenges, Ninja Warrior will focus on certain obstacles that students will train specifically to overcome. Both classes, however, will teach students to be as fast, strong, and efficient in their movement as possible. If you or your child love to climb, jump, swing, and balance, or to challenge yourself physically and mentally, come in and give the course your best shot! Our new setup will also be open to teens during Friday teen nights and open to adults during Adult Classes on Monday and Wednesday or Free running open sessions Saturday and Sunday. Saturday and/or Sunday – 5:45 p.m.-8:15 p.m.
Saturday and/or Sunday: 5:45 p.m.-8:15 p.m.